Kingston, the capital of Jamaica, (a prime area) is the largest and most populous city in the island nation. Overlooking a natural harbour bounded by a long spit of sand known as the Palisades, it has a well-developed waterfront area. Its beaches are renowned. Hellshire Beach, known for its white sands and delicious fried fish, is very popular. Less crowded is the island of Lime Cay, which also has white sands and even clearer water. Kingston’s modern high-rise buildings stand out against the stunning backdrop of the Blue Mountains. Upscale investment properties can be found in the suburbs nestled in the foothills of the Blue Mountains. The most elegant of these districts are New Kingston, Manor Park, Barbican and Liguanea. Downtown Kingston is the city’s area. In 1692, refugees from an earthquake and tsunami that devastated Port Royal moved into the area. After more people sought refuge there following a fire, the town of Kingston was designed and constructed. The town grew quickly, with over 3,000 brick buildings by the end of 18th century. Sadly, many of these buildings were destroyed in an earthquake in 1907. A regulation was passed that the buildings in Kingston’s central business district should be no more than three storeys high and made of reinforced concrete, but eventually taller buildings were constructed. The centre of reggae music, Kingston is known for its colourful nightlife. Dining is especially good, though the dance clubs are few. Its beaches are especially enjoyable as Kingston is protected from tropical storms by the mountains. The 20-hectare Hope Botanical Gardens, near the Mona campus of the University of the West Indies, is a wonderful place for a stroll. Some of the interesting museums in Kingston are the White Mark Arawak Museum and the National Gallery of Art. Among the historical landmarks here are the parish church and the Devon House, a 19th century stately home which is also a museum of local arts and crafts and a good place to get an ice cream. There is also a delightful crafts market. Kingston is a modern, well-planned town. But its downtown area has become rather shabby. 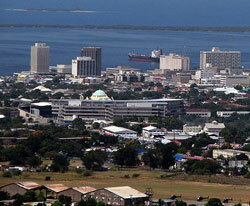 Typical of a sprawling urban area, Kingston has slum areas, spreading shanty towns, and a high crime rate.